Burger King adds some heat to the premium-end of their menu with the launch of the new Spicy Crispy Chicken Sandwich. The spicy version of the Crispy Chicken Sandwich features a white meat filet that comes seasoned and breaded with "bold spicy flavors," served with the same lettuce, tomato, and mayo on a toasted potato bun. You can find the new spicy sandwich at participating Burger King restaurants nationwide for a suggested price of $4.59. For a limited time, it is included in the selection of the chain's "2 for $6 Mix or Match" deal along with the regular Crispy Chicken Sandwich and the Whopper. 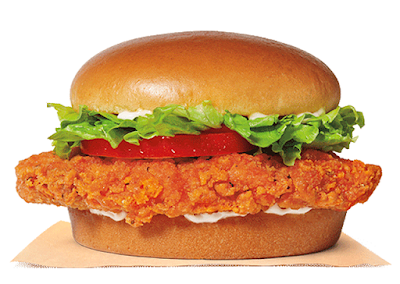 Burger King's last take on a spicy chicken sandwich came in the long form of the Spicy Chicken Sandwich back in 2014.